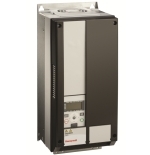 Variable frequency drives for induction and permanent magnet motors. Compliant with EMC and LVD. HVAC232 and HVAC402 are compact in size and flexible in application with one free slot for an option board. Easy to operate and commissioning with an embedded wizard. Torque characteristics can be adjusted to square for pumps and fans or to constant for machines in industrial or process operation.